The supratrochlear nerve, among the two terminal branches of the frontal nerve, is the smaller one and flows anteriorly over the trochlea and tendon of the superior oblique muscle along with the supratrochlear artery. The supratrochlear nerve emerges from fibers of the frontal nerve, the largest division of the ophthalmic nerve. The frontal nerve travels anteriorly under the periosteum of the roof of the orbit and move in the orbit via the superior orbital fissure. The frontal nerve produces the supraorbital nerve, large lateral branch and the supratrochlear nerve, small medial branch. 1. Before emerging onto the forehead, the supratrochlear nerve produces a small downward branch towards the infratrochlear branch of the nasociliary nerve. Emerges onto the forehead via the frontal notch. Travels medial towards the supraorbital nerve at the supraorbital rim. 3. At the level of the supraorbital rim, the average distance in the middle of the supraorbital as well as supratrochlear nerves is 1.06 cm. The skin and conjunctiva of the upper eyelid. The skin of the lower, midline of the forehead. 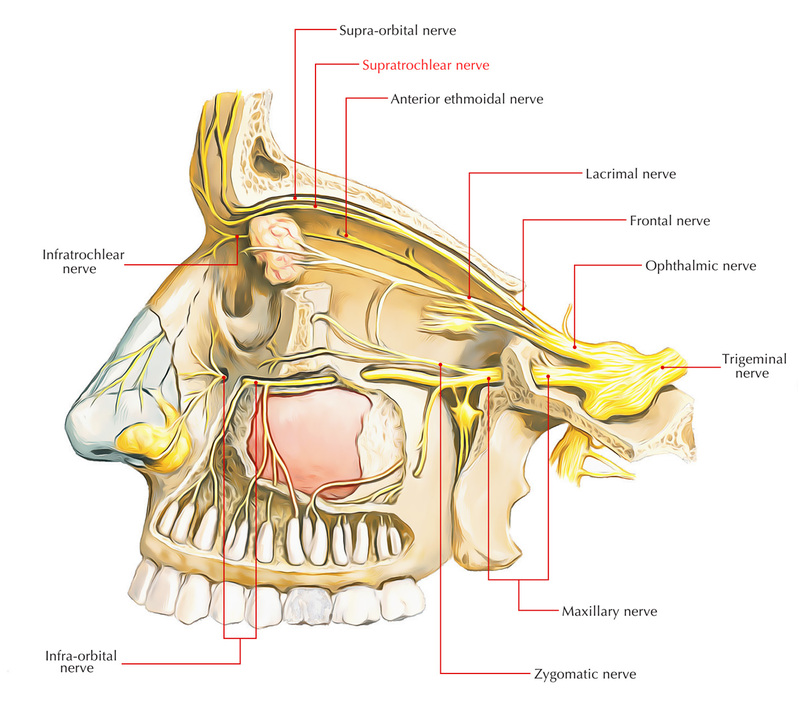 The supratrochlear nerve block is often made in order to attain local anesthesia at the ipsilateral forehead along with the supraorbital nerve block. A frequent indication for this block is to enable repair of scalp lacerations without the alteration of anatomy which a local area block can create. It is also used for giving anesthesia for scalp excisions, frontal craniotomies, or frontal ventriculoperitoneal shunts. It is used along with steroid injections for post-herpetic neuralgia or trigeminal neuropathies. Anesthesia to the affected area. The supraorbital nerve is spread more centrally as well as laterally, and it innervates the upper eyelid, mid-forehead along with mid-scalp. The supratrochlear nerve protrudes more medially alongside the forehead and scalp, and supplies the medial upper eyelid, medial forehead, along with medial frontal scalp. Some overlap in the sensory circulation among these two nerves causes conservation of some amount of stimulus may happen with transection of only one of these nerve trunks.